Get this free digital agency website template which has ample features to construct websites for digital, advertising, marketing, or other service agencies. 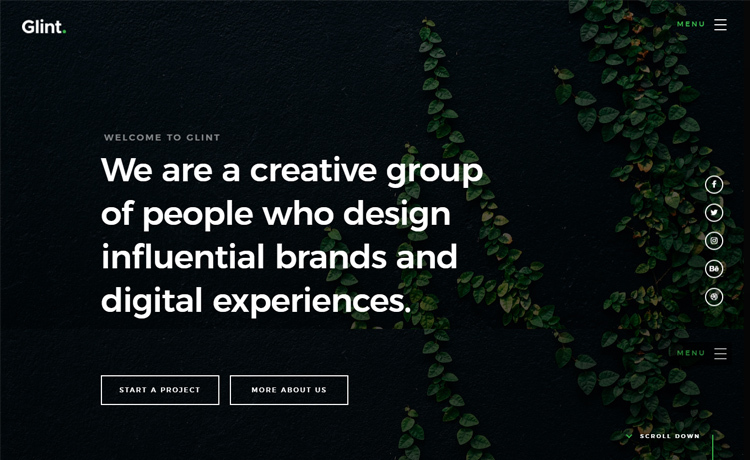 Glint is a free digital agency website template that offers all the necessary supports to craft a compelling website for agencies. It’s amazingly responsive, meaning your site will appear perfectly even on the smaller devices. This one page free HTML template has many off-the-grid features to ameliorate the user-experience in a significant manner. Without further ado, let’s dig deep. For passionate designers and developers, Glint brings myriad of opportunities to offer the innovative services for the clients. Other than the digital agency, this digital marketing website template has the perfect solutions to build websites for design firms, advertising company, and marketing agency. Moreover, you can take the template for personal, portfolio or any other commercial projects. On the top, it has a hero header with parallax effect, sticky burger menu, social media buttons with on-hover animation, and two ghost buttons. If you scroll down, the animated counters, colorful UI, and beautiful sections of this free HTML5 template will impress your mind. Moreover, Glint empowers you for branding the business in an interactive way. With working contact form and newsletter subscription people can involve with your offers and services. The variations in screen size and resolution don’t matter for Glint because it is both responsive and retina ready. Along with 2 HTML and 7 CSS files, it included two Google fonts as Lora and Montserrat and 1 PHP file for mail sending. Portfolio and animated stats are two lovely sections of Glint, and those are beneficial, too. The off-canvas menu is another convenient option to help the users to go to their expected section. Furthermore, Glint also incorporated an additional page for the style guide. Using this page one can easily understand every tiny part of this creative agency HTML template. Paragraph and Image, Drop Caps, Small Print, Pull Quotes, Block Quotes, Buttons, Lists, Skill Bars, Headings, Stats Tabs, Responsive Image, Responsive video, Tables, Form Styles, and Alert Boxes – the visual examples of these things are well-described in this special page. Don’t get baffled in search of Bootstrap templates because we’re relentlessly updating our collection of free website templates. If you go one step further and look at our premium templates your eyes will get stunned with their visual aesthetic and comprehensive quality. Seeing is believing; so start with Elixir which is a sophisticatedly built Bootstrap 4 template for corporate and business niche. Also, we highly recommend another two staggering templates – Posh and Baikal. Fair design pattern. Love it. Thank you !! Love it page web ! Hello, when I upload the free template to my hosting on the internet does not work. Can you help me? Do does work me ok on a local server and yet does not work on the hosting server? Can you please send us the link of your hosted site? Exelente! Pero no me llega ningún link, que puedo hacer? If you want to use it in your project, fix the errors then. Hey Ana, thanks for your comments. I see, you do care us and admire our works. A friendly request: please comment in English next time. Good luck. just two questions. Can i disable the preloader ? How ? You have to delete the preloader blocks from index.html, main.js, and main.css. I hope it helps. Thank you. Muy linda pero no deja instalar. Gracias. Sent you the download link. Bonita plantilla, no puedo descargar. Gracias. I’ll send the link. Sent you the link. It will work hopefully.